My Girl was one of a small group of children invited to attend the Official Launch of the National Year of Reading at the Australian National Library, on Monday last week. The School most thoughtfully sent home a CD full of images from the day and I am happy they captured the shot of Julia with the kids that I have shared here. She was asking them about their favourite books. The political element of the day was lost on My Girl and she was most wowed by the nice lunch, great performance & lovely backpack of books and goodies that they were gifted with to bring home. 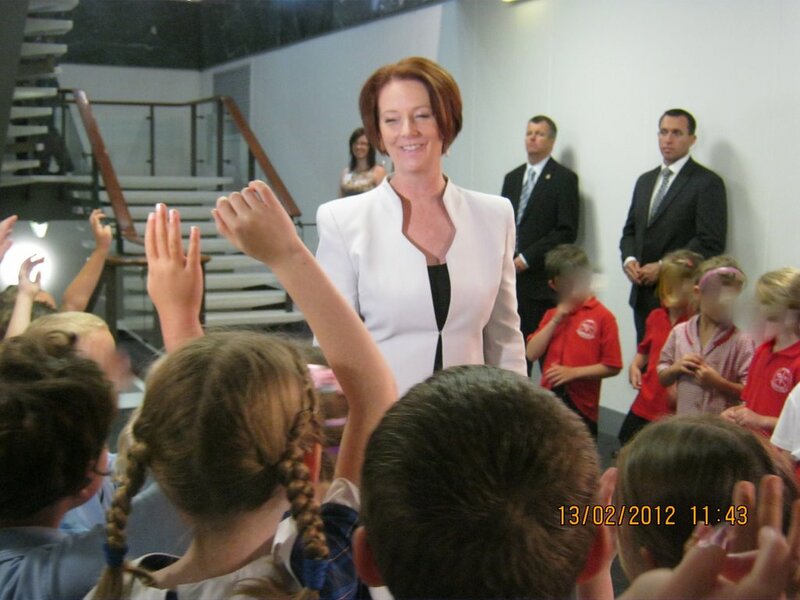 Though it is not the most flattering shot of Ms Gillard it is a great memento for my Daughter of when she met the Prime Minister. Prime Minister Julia Gillard talks to the Children. Rach and her class mate who attended wrote the paragraphs relating the event on the school quick flier this week too. I'm so proud of my sweet Girl.